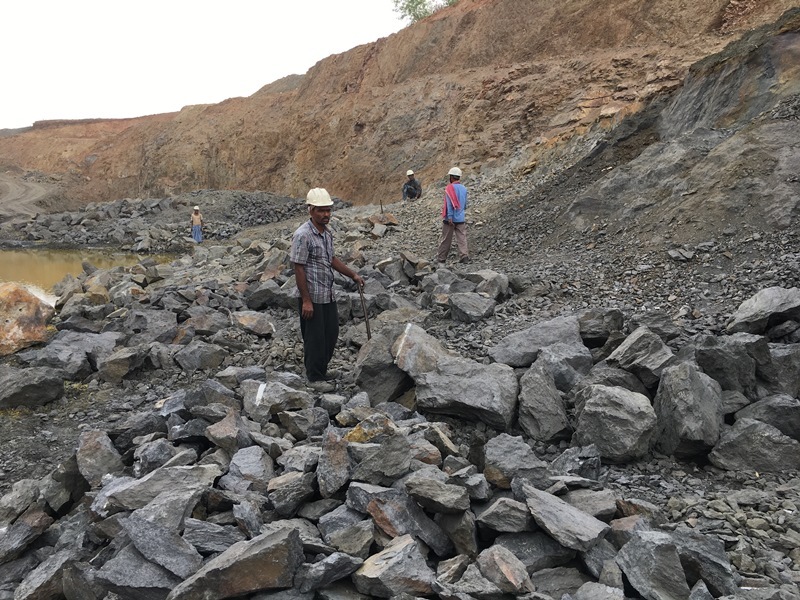 India’s Tirupati Graphite Group has been a leader in flake graphite production for over two decades supplying refractory, foundry and speciality markets; pictured is the mine at Gaura in Palamau district, Jharkhand state, which has a production capacity of 50,000 tpa flake graphite. Tirupati is evaluating other deposits in the district, as well as developing a new mine in Madagascar. 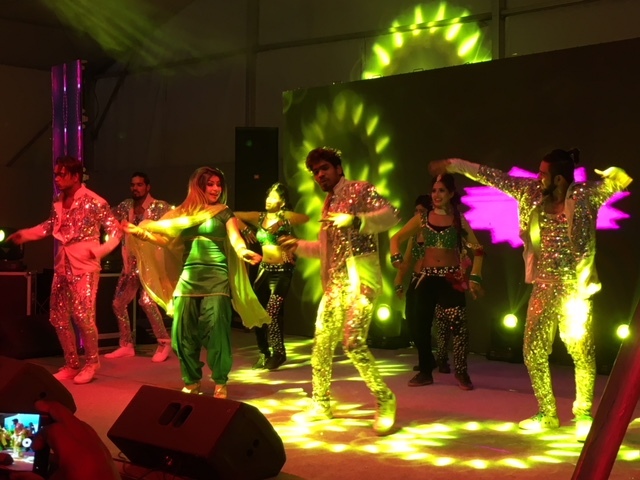 Yes, the weather was warm and pleasant, as was the hospitality, and the quality of attendees appeared to excel over the 2016 event by most accounts. But what a difference two years makes in the refractories world: this time the conference was markedly upbeat in nature, fed by positive market performance. However, there was no doubt that the positive vibe was somewhat tempered – particularly if you were a refractory producer – by the overriding challenge (verging on desperation among some attendees) of securing high quality volumes of refractory raw materials in light of the current supply squeeze from China. This issue was forcefully driven home, with respect to India’s refractory requirements, in the Inaugural Session by Hakimuddin Ali, IRMA Chairman, and complemented at the CEO’s Roundtable, and in subsequent presentations by Jürgen von Raesfeld, Managing Director, Possehl Erzkontor HK Ltd, and Mike O’Driscoll, Director, IMFORMED (see below). 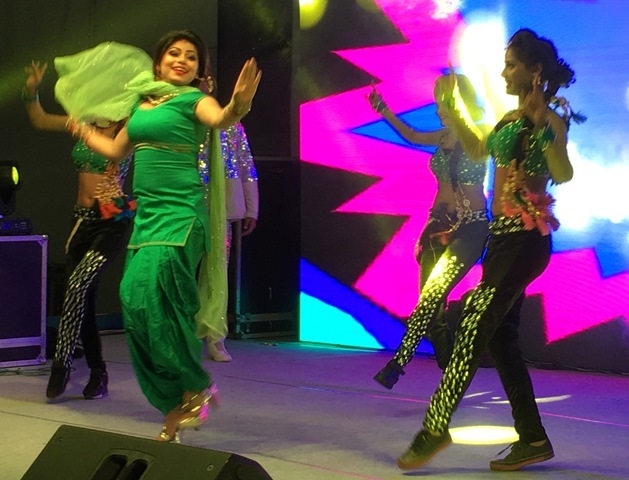 Despite the concern over raw material supply, nothing could detract from the most enjoyable colourful and vibrant Bollywood experience afforded by the Gala Dinner evening sponsored by Dalmia OCL. The 12th India International Refractories Conference – IREFCON18 took place 7-9 March 2018 at the Hotel Vivanta by Taj Dwarka, in New Delhi with the theme “Refractories solutions through user collaboration”. 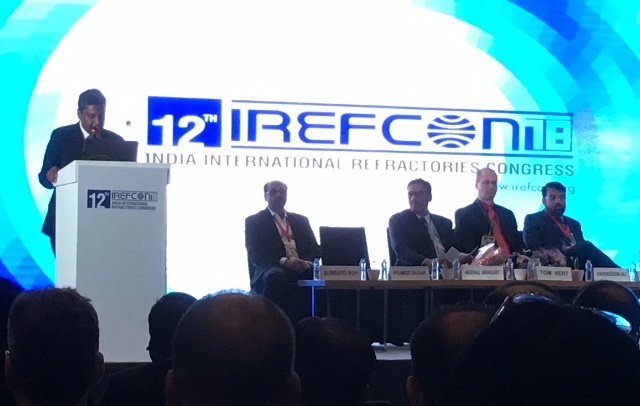 With some 450+ delegates and 32 exhibitors, IREFCON is now firmly on the refractory event circuit as one of the leading shows bringing together all those active in the supply chain of refractories, with a strong focus on India and Asian markets. Keynote Speaker, Tom Vert, VP Manufacturing, ArcelorMittal Dofasco GP, USA, underlined the theme of the conference by sharing the African proverb: “If you want to go fast, go alone. If you want to go far, go together”. Vert demonstrated that to get the best refractory match for the specified process, a partnership of trust between end user and supplier working together is the best approach for a win-win scenario. 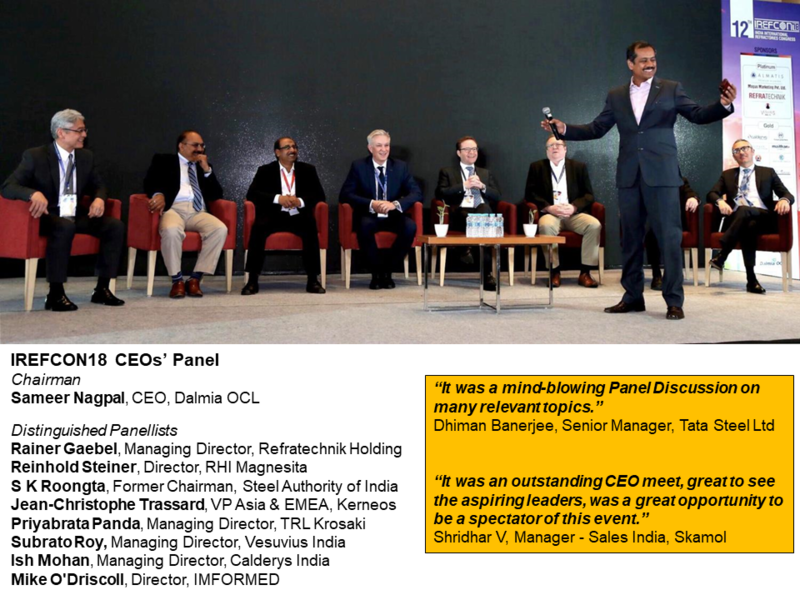 For the first time at IREFCON the Inaugural Session included a CEO’s Roundtable, which was eloquently hosted by Sameer Nagpal, CEO, Dalmia OCL, discussing the theme “Collaborating in times of uncertainty: challenges & opportunities” across a range of important issues. 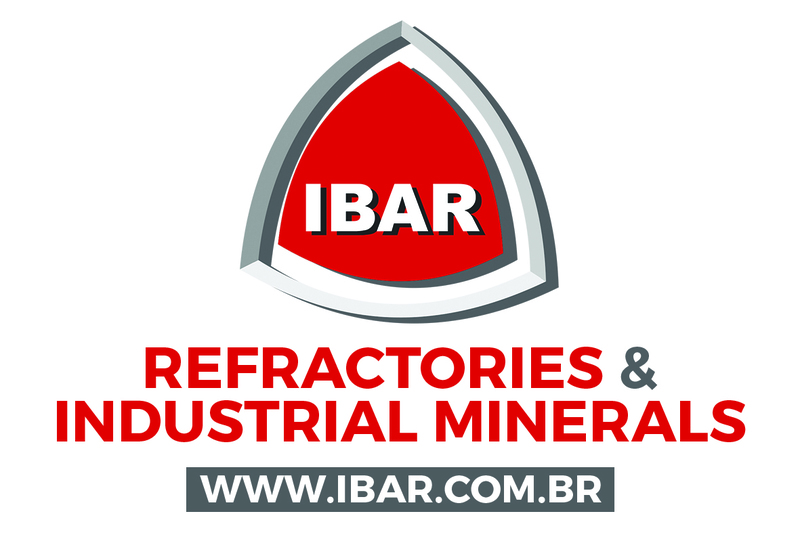 A wide range of papers covered topics within ironmaking, steelmaking, non-ferrous, new technology, case studies, product design, and testing/refractory installation. 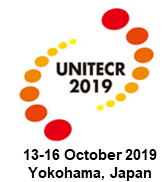 Refractory raw material presentations included: natural and synthetic aluminas and aluminosilicates (Danilo Frulli et al, Imerys Aluminates), additives for silica-fume castables (Goutam Bhattacharya et al, Imerys Aluminates), MgO-zirconia powders (Johan Loricourt et al, Imerys Fused Minerals), andalusite (Florian Ahouanto et al, Imerys Aluminates), sillimanite minerals (Dilip Jain et al, Kyanite Mining Corp.), and magnesia (Mike O’Driscoll, IMFORMED). Described in his paper “Refractory raw materials – a strategic analysis in Indian context” as the “single most important challenge”, Hakimuddin Ali, IRMA Chairman and Chairman Imerys India, drove home with some passion the high concern over the shortage of high quality refractory mineral resources in India. “There is an immediate need for commercially viable [domestic] fusion of magnesites of different grades to reduce dependence on imports” said Hakimuddin Ali, IRMA Chairman at the Inaugural Session. This has most recently been brought into sharp focus owing to the tightness of mineral supply from China, on which India’s refractories industry relies heavily for imports of dead burned and fused magnesia, tabular alumina, refractory bauxite, and graphite (see Newsfile 13 February 2018: Dog Days ahead for Chinese mineral consumers?). “China’s high profile disruptions to industrial operations have wreaked havoc in the raw material supply chain taking prices to new highs.” said Ali. 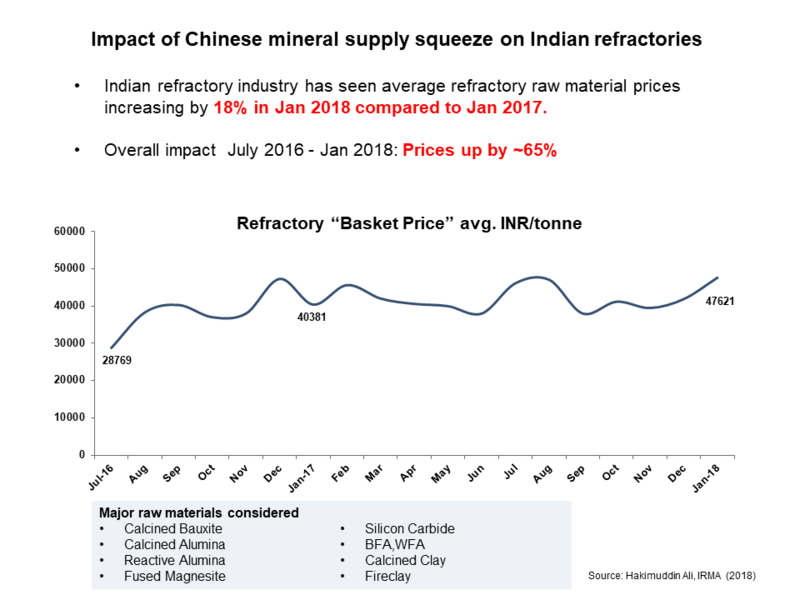 The Indian refractory industry saw average refractory raw material prices increasing by 18% in January 2018 compared to January 2017. The overall impact since July 2016 has seen prices rise by around 65%. Ali stressed the need to enhance domestic raw material production and the use of alternative sources as “key to remain competitive in the current scenario”. His presentation assessed the present scenario of key raw materials: fireclays, alumina, magnesite, bauxite, diaspore, sillimanite minerals, zircon, and chromite. Although fireclay resources are abundant in India, Ali revealed that fireclay found above coal beds was being dumped, causing an acute shortage of good quality fireclay. Of concern was the availability of low-iron refractory bauxite. With some 2.5m tpa consumption of refractory grade in India, current reserves are expected to last only 6-7 years unless fresh reserves are identified and released for mining. Similar issues exist with magnesia, India possesses no fused magnesia producer, and there is very limited dead burned magnesia production. North Indian Himalayan deposits are high in iron content and not suitable for refractory bricks, while the Salem deposits of south India are high in silica and low in lime and iron, making them only suitable for certain brick applications. Most chromite is imported, and Ali recommended more domestic reserves to be identified and fused magchrome grains to be manufactured by beneficiating both magnesite as well as chromite if required. There is sufficient domestic capacity for fused alumina and fused mullite demand, and for certain speciality aluminas, although all tabular alumina is imported. The abundant availability of quartz and quartzite in India should create opportunities to make viable ventures for domestic production. Initiatives by IRMA to address these raw material issues include teaming up with Dept. of Ceramic Eng. IIT BHU Varanasi to create a world class Centre of Excellence for Refractories and spreading the word through the relevant industry media. “Over the past decades, the world strongly relied on the supply of refractory raw materials from China. There should be no doubt about the significant influence China has on the worldwide industrial mineral scenario and that surely includes our refractory raw-materials.”: so commented Jürgen von Raesfeld, Managing Director, Possehl Erzkontor HK Ltd in his presentation “Global refractory raw material scenario with main emphasis on the situation in China”. And never a truer word was spoken; von Raesfeld went on to illustrate how President Xi Jinping is pushing for “supply side reforms” which so greatly impacted the refractory mineral supply sector in 2017 and will continue to do so. “All in all we are looking at a huge clean up” said von Raesfeld. “Xi-conomics” is targeted to phase out smaller, outdated plants and replace them with larger, modern and environmentally clean conglomerates. 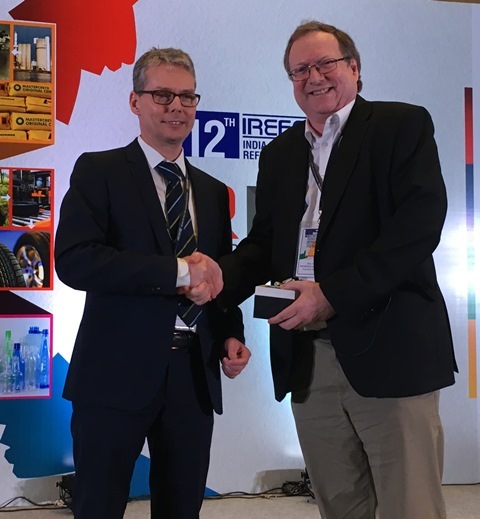 Session Chairman Christoph Wohrmeyer, Imerys Aluminates, presents Mike O’Driscoll, IMFORMED with his IREFCON18 Speaker’s gift. Another solution highlighted was to utilise so- called “inferior” raw ores, exemplified by the “3-Step magnesia fusion plant” in Liaoning, China, which von Raesfeld reported was now in full operation and consumes low cost “rejected raw ores” in a flotation system to produce fused magnesia with improved and extra large crystal sizes. 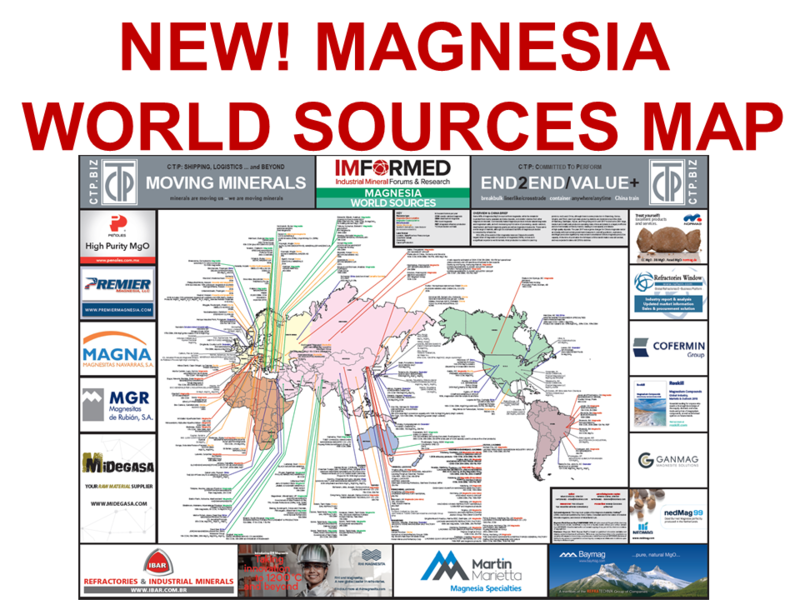 The topic of magnesia supply was continued by Mike O’Driscoll, Director, IMFORMED in his presentation “Refractory magnesia supply update” where he reiterated the issues in China which continue to create high prices and short supply, and outlined a range of plant expansions and ongoing magnesia projects emerging outside China which could attract frustrated consumers. 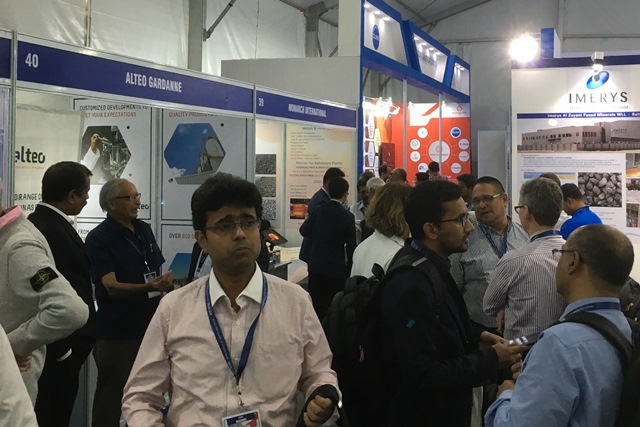 Among these was the recent development, revealed at IREFCON18, by Ashapura Group, India, in planning to develop a high-quality magnesite “captive mine” outside India in order to import raw ore to an Indian processing plant for calcination/fusion. Manan Shah, Director, Ashapura Group also presented on the company’s work in developing domestic low-iron bauxite sources for the refractories industry through recovery from existing resources, including former mines and previously considered “unviable” bauxite resources. 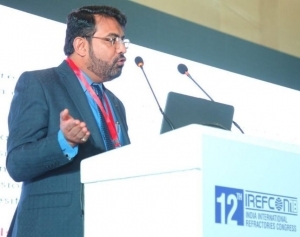 Ashapura’s bauxite and magnesia projects very much chime with Hakimuddin Ali’s clarion call at IREFCON18 to the Indian industry to respond with such initiatives to the prevalent tight raw material supply situation. We look forward to meeting you in Hamburg and/or Shanghai!